Dr. Chandra Belani provided guidance to Winship leadership in building a world class lung cancer program here. Winship Deputy Director Suresh Ramalingam, MD, first met Chandra Belani, MD, 17 years ago during his fellowship training at the University of Pittsburgh. 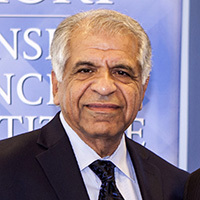 He had heard about Belani's research work and reputation as a major contributor in the field of lung cancer. What Ramalingam didn't know was that Belani would go on to have a profound impact on his own career. "He was instrumental in training me as an oncologist, researcher and a leader," recalls Ramalingam. 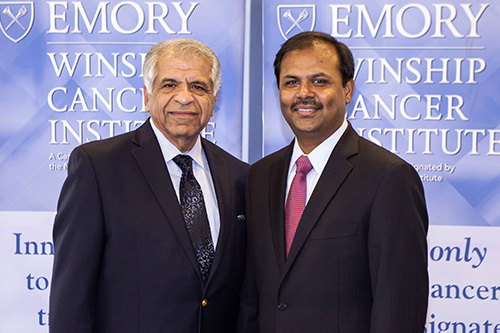 "Over the years, he has also continued to advise us on building a world class lung cancer program at Winship." Belani, who serves as deputy director of the Penn State Hershey Cancer Institute, has continued to collaborate with Ramalingam's team, work that has resulted in the publications of several papers in top tier journals. The advice Ramalingam received from Belani years ago has left a lasting impression: "if you are given a project, take ownership, bring your best effort, and bring it to fruition, regardless of where it leads you." Chandra Belani, MD, with Winship Deputy Director Suresh Ramalingam, MD.